Kevin Geaker and his son Jared, aka the Geakers, have been in business in Bethlehem, PA, in the beautiful Lehigh Valley, for 15 years. Over the years the Geakers Taco stand, and their travelling taco trailers, have served well over 500,000 tacos. The real beauty of it is they use Abuelita tortillas. As you can see from the pictures, the tacos are ample to say the least. 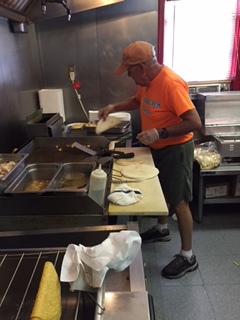 They use 8 inch flour tortillas – whereas the rest of the world is still using 6 inch tortillas. 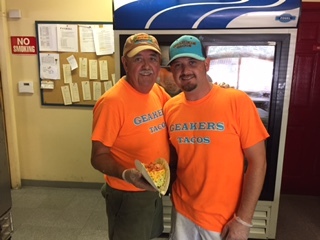 Besides being a father/son, small family business, the real treat to these tacos is the tortillas are fried briefly, hand dried with paper towels, stuffed with beef, chicken, or fish, then smothered with whatever toppings are desired. 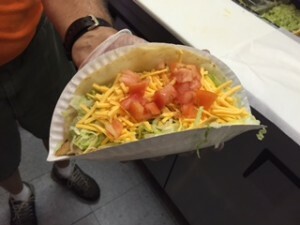 The end result is a flour tortilla taco that is fried slightly crispy, but still has the soft chew of a flour tortilla. The beef taco, with “everything” and hot sauce, is a classic. Abuelita wants to thank the Geakers for their patronage and for using Abuelita tortillas for so many years. They certainly understand that quality of product creates quantity of sales. 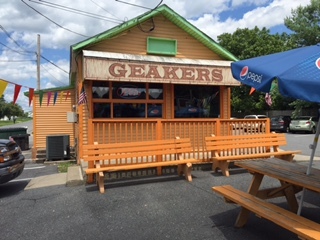 Look for the Geakers Taco trailers at fairs, festivals, and carnivals throughout Northeastern, PA. You can also stop by the Taco Stand at 3531 Freemansburg Avenue in Bethlehem, PA for a great taco, milkshake, and the best hospitality around.